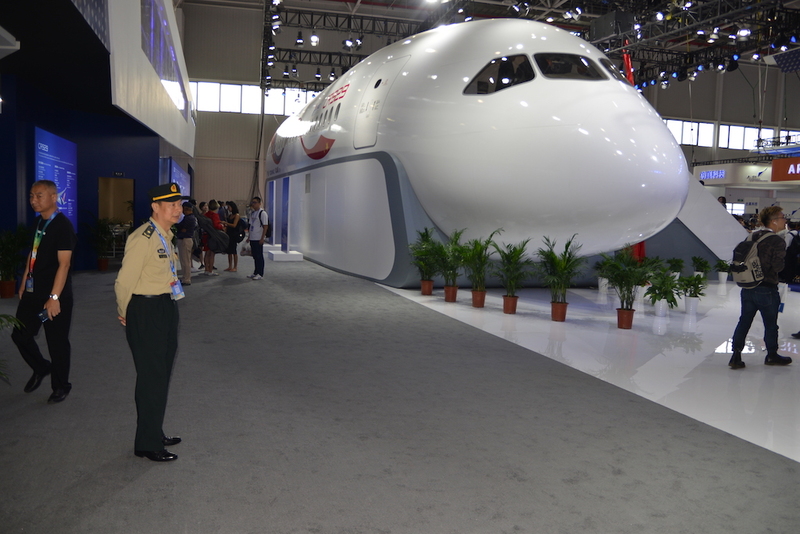 Russia’s UAC and China’s Comac unveiled a mockup of the forward cabin section in their jointly developed CR929 widebody jetliner just before the official opening of the 12th biannual China Airshow in Zhuhai on Tuesday. Comac general director Zhao Yue Rang described the CR929 as “a strategically important project” and a means of strengthening the relationship between China and Russia. Last year, the sides established the China-Russia Commercial Aircraft International Corporation, or CRAIC, a joint venture to manage the project. CRAIC director and president Guo Bo Zhi reminded attendees that the aircraft received the designation CR929 in September 2017, when the founders instructed the joint venture to develop a family of aircraft consisting of a baseline CR929-600, a CR929-500 shrink variant, and a CR929-700 stretch version. Apart from passenger carrying roles, the airplanes would also serve as a freighter, business, private, and special-purpose variants. A multidisciplinary integrated design, the CR929 would feature electric thrust reversers, braking, and flight control actuators. Half of the structural weight will consist of composite materials and titanium. All versions feature a common wing with a span of 63.3 meters and a “next-generation supercritical design.” The fuselage of the baseline CR929-600 measures 63.8 meters long and accommodates four seating layouts as factory standards. The first would consist of a first-class compartment for eight travelers, a business class for 30 and economy for 243 passengers. The second version would hold 291 seats through the removal of the first class to clear space for additional business seats. The airplane would also come in two all-economy class layouts, one with 405 seats arranged with a 32-inch pitch and 440 at 30 inches. In all cases, the economy class features three sections of three seats. The exhibition mockup shows that the cabin cross-section allows for the placement of either four first class or six business class seats.